We get it — incorporating different patterns into your decorating scheme can be incredibly intimidating. But we promise, with a little insider knowledge you can mix and layer patterned décor successfully like a pro. The trick to learning how to get it right is understanding the basic rules. Afterward, you can confidently break them or not. What's the most significant need to know? In general, when layering patterns, it is best to combine prints in different styles and scales. The latter is super important. The most prominent pattern in the room, typically a rug with a colorful motif, sets the tone for the rest of the space. Afterward, additional layers of complementary or contrasting patterns in smaller sizes boost visual interest. Those items often include accent pillows, throws, furniture, and curtains. Confused? Do not be. Whether you are a design traditionalist or a décor maverick, the following ideas share the best ways to mix patterns when decorating. This colorful living room demonstrates the basics of pattern matching. California based design company Taylor and Taylor stuck to four different patterns in three different sizes. Each pattern is distinct but has a similar feel. The wool rug with the large free-flowing geometric shapes sets the tone. A single accent pillow features the second largest pattern — a repeating triangle and diamond design in navy that riffs off the rug's color and style. Lastly, two smaller patterned pillows with squiggly designs play a supporting role. Geometric patterns give a small sitting area with a monochromatic color scheme a big dose of pep. The two large prints on the wall inspired this space by interior designer Jennifer Talbot based in Chicago. The two chairs with the second biggest pattern anchor the nook. Underfoot is a subtle zigzag patterned wool rug. This rule-breaking living room packs every shade of the rainbow to create a little slice of bohemian paradise. The mother and daughter design team behind Alida and Miller situated in Australia designed the space. They call their unique decorating style perfect imperfections. What makes this mash-up of patterns work? The pale blue walls ground the space by coordinating beautifully with the various textiles in vibrant colors from the Far East. Sticking to a specific type of pattern can create a sense of cohesion in a space. In this boho styled living room by Commune Design based in Los Angeles, California, several different Turkish kilim accent pillows with slight variations in color and pattern, top off the Moroccan day beds. A general rule of thumb is that the most prominent pattern in the room should be covering the floor. In this chic little living room seen on Homepolish, a rug with an oversized pattern anchors the space. Accent pillows in a mixture of styles and different scale patterns lend visual interest. Our favorites are the shibori tie-dyed cushions on the rattan chairs. Spice up a neutral room with two different floor coverings. Here Chicago based interior designer Jennifer Talbot layered a couple of rugs in two different jaunty patterns. In this ridiculously chic black, white, and brown conference room by New York City-based Mammoth Projects gorgeous wallpaper in a Native American inspired design pairs beautifully with a tribal styled wool rug. Yes, sometimes more is indeed more as is the case with this tiny, eclectic living room by interior designer Paige Morse based in Dallas, Texas. Two colorful pillows inspired the bold mixture of patterned fabrics from across the globe. Together they combine a cozy nook with a happy hippy vibe. Color and texture both play a prominent role in this modern living room by Chicago interior designer Jennifer Talbot. The bold, pink geometric rug is the main pattern that lights up the neutral furnishings. The curtains featuring a subtle abstract design add a second layer of pattern. The finishing touches are the accent pillows in four different patterns in a range of scales for contrast. Our favorite is decked out with pink pompoms. The easiest way to pull off combining patterns is sticking to two distinct and very different designs in coordinating shades. Here Mandarin orange and indigo blue go together like peanut butter and jelly in this dining room by New York City interior designer Alison Causer. On the walls is a bold geometric wallpaper pattern called Imperial Trellis by Schumacher. Covering the floor is a large area rug with a soft floral pattern by Safavieh. Here is a drool-worthy space by New York City interior designer Tali Roth. On the wall is wallpaper featuring an oversized floral pattern on a saturated black background. Covering the sofa is black and white Toile fabric depicting a lovely pastoral scene. The frosting on the cupcake is the subtle gray, peach, and white pattern on the painted wood floor unites all of the colors in the room. Avoid pattern overload by combing a crisp white backdrop with pops of lovely color. In this open concept home by Los Angeles based interior designer Haley Weidenbaum, a woven diamond pattern rug anchors the living room. A rag rug ottoman that doubles as coffee tables bring rustic stripes to the party. On the sofa are whimsical accent pillows with colorful tassels. Patterns in rich, moody colors are having a huge moment. A pitch-perfect example is this den by Greene and Grey Interior Design a firm based in San Francisco, California. The room pairs a dramatic geometric print with an organic pattern. Lining the glossy hunter bookcase is a striking chevron wallpaper. On the floor is a speckled cowhide rug that softens the space. 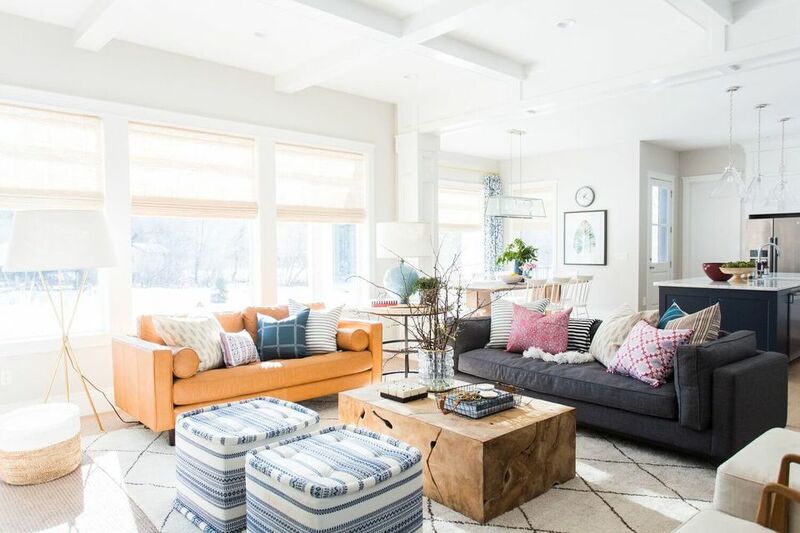 The large painting on the wall provided the color scheme for this living room by interior designer Amy Fasnacht from Havenly. The pink and orange Turkish rug centers the space. The black and white curtains add contrasting pattern. A mix of accent pillows unites all the colors used throughout the room into a proverbial bow. Here is another example of how to mix patterns in a white space. The rug, sofa, chair, and accent pillows in this chic little space spotted on Lovely Life all feature different prints in different textures. What pulls the look together are the varying tones of green and blue that work with the bold painting with the saturated red background. A charming bedroom by designers Pentreath and Hall situated in Bloomsbury, London shares a simple solution for mixing up prints. The modestly sized space features three different and straightforward patterns all using a similar shade of green. On the wall is a trellis wallpaper features an organic design. The polka dot pillow adds a splash of contrast. The striped wool camping blanket on the bed adds extra zest. Bringing together oodles of multihued prints does not have to feel like a colorful cacophony. What makes this vibrant bedroom by New York interior designer Marco Ricca Studio work? Three simple things: Sticking to a color scheme, using only smaller prints on the bed, which is the biggest object in the room, and painting the walls white. The design team behind Studio McGee based in Salt Lake City, Utah used a combination of low and high contrast prints in different colors to create this relaxing living room. How many patterns did they use? We count 11. A single pattern makes a huge splash in this nursery by KR Interiors based in Westport, Connecticut. The walls, window shade and ottoman are all covered in an Ikat inspired tie-dye design. Breaking things up is a bespoke love print. Graphic throw pillows can punch up your decorating game. This sweet idea by Chicago interior designer Jennifer Talbot uses black and white accent pillows in four distinct patterns to lend a little edge to a minty fresh kitchen banquette. Designs by Human a firm based in New York City created this pop art inspired space. Polka dot wallpaper lends a big slash of whimsy. A Greek key area rug offers contrast. The colorful upholstery on the two cushion seats marry all the hues in the room. Matching shades of blue enliven this dining room by San Francisco based interior designer Grant K. Gibson. The leaf patterned wallpaper lends an organic vibe. The upholstered dining seats bring geometry to the table.